Back by popular demand, on March 21st, 2019, the Margaret Donnelly O’Connor Education Center hosted our Second Job Readiness Workshop in the Ethel Lawrence Executive Conference Room. The purpose of the workshop was to educate a new crop of attending students on the skills necessary to obtain gainful employment, from the initial job search to the acceptance of an offer. During the workshop, we covered three main areas: resume preparation, interview etiquette, and professional behavior while on the job.This year, we were fortunate to have a corporate recruiter on site to provide tips and tricks to creating stellar resumes. At the local, state and national levels, Holy Cross alumni are fighting to create affordable housing for all. Read more about Peter J. O’Connor’s lifelong mission to help the poor with quality affordable housing in New Jersey. Peter J. O’Connor, part of the legal team that spearheaded the landmark Mount Laurel affordable housing case and a longtime advocate of fair housing rights, was named the first recipient of the Housing and Economic Development Hall of Fame Award Monday night. The award was presented on the eve of the Governor’s Conference on Housing and Economic Development, which takes place October 2-3 in at Harrah’s Resort in Atlantic City. 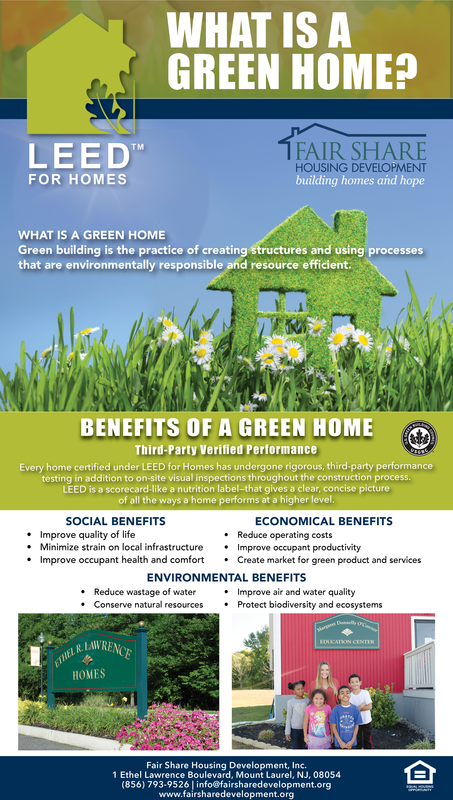 FSHD is pursuing LEED certification for its new properties in Mount Laurel: Ethel R. Lawrence Homes III and Robinson Estates. Leadership in Energy and Environmental Design (LEED) is a rating system devised by the United States Green Building Council (USGBC) to evaluate the environmental performance of a building and encourage market transformation towards sustainable development. LEED is a scorecard – like a nutrition label – that gives a clear, concise picture of all the ways a home performs at a higher level. For more information, click here. The waiting list for two-bedroom and three-bedroom apartments in our New Sharon Woods complex in Deptford Township is now open. Please download the application online, fill it out and return with all supporting documents on Tuesdays and Thursdays between 10 a.m. and 12 p.m.